Processing by autoclave is far more costly than oven heating and is therefore generally used only when isostatic pressure must be applied to a workload of comparatively complex shape. For smaller flat parts, heated presses offer much shorter cycle times. In other applications, the pressure is not required by the process but is integral with the use of steam, since steam temperature is directly related to steam pressure. Rubber vulcanizing exemplifies this category of autoclaving. For exceptional requirements, such as the curing of ablative composite rocket engine nozzles and missile nosecones, a hydroclave can be used, but this entails extremely high equipment costs and elevated risks in operation. The hydroclave is pressurized with water; the pressure keeps the water in liquid phase despite the high temperature. The key component of the industrial autoclave is the fast-opening door; this is also the critical component in cost of autoclave construction. On one hand, the operator must be able to open and close the door quickly and easily; on the other, the door must satisfy stringent safety requirements. Such is the quality of autoclave door design that the US experiences as few as an estimated five or six autoclave failures annually. Autoclave design is driven by various safety standards, foremost among which is the ASME Pressure Vessel Code. While most nations use the ASME code, some have developed their own. The CE standard in Europe applies to vessels as well as to electrical controls, and China requires that pressure vessels comply with their domestic code. All codes specify conservative requirements intended to maximize safety. Local governments may also impose licensing requirements related to autoclave operation. Pressure vessel design involves Barlow's formula, used to calculate the required wall thickness. However, the design of a complex pressure containment system involves much more than the application of this formula. For almost all pressure vessels, the ASME code stipulates the requirements for design and testing. Prior to delivery, the pressure vessel is hydrostatically tested at 130% of its rated pressure under the supervision of an ASME code inspector. It is filled with water, and a small pump raises the pressure to the necessary test value, at which it is held for a specified time (30 minutes according to the ASME code). The inspector checks for leaks as well as evidence of flaws or inadequacies in the welding. The design of small autoclaves need not take into consideration the possibility of drawing a vacuum inside the pressure vessel, but this assumption must not be made in larger ones. Steam autoclaves, for example, can be exposed to an internal vacuum if the steam fully condenses while the vessel remains sealed. Although external pressure cannot exceed one atmosphere, that can suffice to collapse the vessel in some cases. Thus, stiffening may be required. In unusual situations, the autoclave itself might have to be square or rectangular instead of round, or it might be vertical instead of horizontal. If the autoclave is unusually large, it may have to be set into an excavation in the floor if there is to be floor level loading, as is generally the case. The selection of the materials from which the autoclave is fabricated turns entirely upon the application. For steam autoclaves, carbon steel is used, but a corrosion allowance is added to the calculated thickness. This accommodates the rusting that occurs with repeated cycles of exposure to steam, water, and air. Implicit in this is the need to monitor the loss of metal and decommission the vessel when excessive thickness loss has occurred. For temperatures of up to 650 °F (343 °C), no adjustment needs to be made in calculating vessel wall thickness. Above this temperature, the allowable stress is derated. Above 750 °F (399 °C), high-temperature alloys are used. The rated temperature, which is stamped on the vessel's data plate, applies to the vessel wall itself, not to the gas circulating in the autoclave. This is relevant when internal insulation is used to circulate air or gas at a temperature beyond the rating of the vessel. Although the design engineer can use the material of his or her own choice, the normal selection is SA516 Grade 70 PVQ (Pressure Vessel Quality) carbon steel. This steel is particularly well suited for use in pressure vessels by virtue of having an exceptional spread between its comparatively low yield strength of 38 ksi and its tensile strength of 70 to 90 ksi. Elongation in 2-inch-thick (51 mm) plate is 21%. This means that the metal stretches considerably under over-stress before failing. In the event of excessive pressure, parts will deform before breaking, causing a gradual rather than a catastrophic loss of sealing. This loss of pressure then acts to relieve the critical overload on the pressure vessel structure. This failure mode presumes the absence of significant cracks in the over-stressed metal. Because this grade is used in pressure vessels, it is available in thickness variations of a sixteenth of an inch as well as large plate sizes. It is readily welded and is fully machinable. The pressure vessel specification will include both the highest and the lowest temperatures to which the vessel shell is exposed. Since steel properties change as the metal becomes colder, the vessel will be stamped for an MDMT of -20 °F unless the user requires lower. Customarily, the metal thickness is driven by the code requirements relating to visual inspection. Thinner metal can be used, providing the welds are radiographed. This saves cost when the metal is not SA516 but stainless steel or a refractory alloy. Of the entire machine, the costliest (depending on the size of the autoclave) and most important single piece of hardware is the fast-opening door. It must be of full diameter to allow access to the working space, seal tightly against rated pressure at the highest shell temperature, operate readily and quickly, and comply with the same safety code that governs the rest of the pressure vessel. Of all safety-related concerns, the most critical are those which relate to the door's operation. There are several types of fast-opening doors commonly used. The simplest and most primitive type of door, a bolted plate or flanged cap on some sort of hinge, is no longer considered even minimally acceptable for production autoclaves because it is anything but quick in opening and closing. For vessels up to four feet in diameter and rated at not much over 125 psi, a hinged semi-elliptical door secured by lever-operated cam-locking T-bolts works essentially as quickly and as easily as the more commonly used rotating locking ring door. This door design uses up to a dozen or so latching T-bolts on the door hub (see photos), the stationary part fitted to the cylindrical vessel itself, which engage matching lugs welded to the door. When the operating levers are rotated over center, the T-bolts draw the lugs closer and seal the door by means of an O-ring gasket. This type is intrinsically safe, since opening the cam-locks under pressure releases the door seal and depressurizes the vessel. In fact, the ASME code does not require interlocks or mechanical pressure indicating devices on such doors. Even when opened, the cam-lock does not allow the bolt to disengage from the latching lug if there is any pressure against the door. Since it is mounted at a small angle to the lug, the bolt cannot be swung outward away from the engaging lug on the door if there is any pull on it. These doors are comparatively simple and economical, well suited for smaller autoclaves. This design is limited to four foot diameters and about 125 psi because of the limited real estate available on the door for the cam-locks and the deflection of the door when the locks are too far apart. Another limitation is the tendency of such doors to distort if not installed correctly. Although very straightforward in application, if the door assembly is not fitted to a correctly made mounting, sealing problems may result. Omitting the reinforcing stiffener on the vessel just aft of the door hub is a good way to learn how true this is. An autoclave with this type of door features heavily reinforced mountings which keep the door in alignment throughout the machine's service life. The O-ring gasket can be replaced in less than a minute and is fairly inexpensive. Autoclaves over four feet in diameter or those rated at higher pressures generally use the rotating locking ring door, also called a breech lock door. This door can be designed for any size and pressure. Both the hub and the door itself are generally non-rotating. The hub is welded to the vessel and the door moves on hinges that align it with the hub as it closes. The door has toothed lugs all around its circumference, with the lugs lined up with corresponding openings in the locking ring, which turns on the hub. When closed, the door faces the hub and an O-ring gasket provides the means of sealing against internal pressure. As the locking ring turns, it cams the lugs of the door forward, pressing the door against the hub. This way, there is no sliding motion of the door face across the O-ring gasket. Thus, the gasket can be an inexpensive O-ring, replacements for which can be made in the user's own shop using ordinary O-ring stock, and it lasts a long time. The very few wear parts on the door are replaceable, making the autoclave a long-lived investment. On doors up to eight or ten feet in diameter, the swing can be manual. It is by no means uncommon to see eight-foot diameter autoclaves whose doors can be swung fully open or closed with a single finger. The advantage to manual swing, aside from lower cost and higher reliability, is that there is far less risk of someone getting his fingers caught in the closing door if he's moving it himself by hand. On machines with manually swung doors, one trivial yet important detail is a door stop to prevent banging when opening. If a large autoclave is installed on a slightly off level floor, then the door, once opened, swings rapidly to the end of its travel. With no snubber of any sort installed, it will slowly accumulate damage and wear. On smaller autoclaves, rotation of the locking ring is sometimes accomplished by manually operated geared devices. On larger ones, pneumatic or hydraulic cylinders are used. Pneumatic cylinders often provide jerky rotation, but they may sometimes be safer because they generally cannot move the door ring as readily when there is much pressure against the door. The rotating locking ring door requires a safety interlock to prevent operation when there is any pressure in the autoclave. It is good practice to incorporate the ability to reverse the door locking ring rotation at any time and without delay. With some doors, it is possible to swing them shut not quite far enough and then have the locking ring jam as it tries to close. It's essential to note that the autoclave is far more dangerous when the pressure is low than it is when the pressure is high. This is because the higher pressures create frictional forces that tend to make the door ring very hard to move. In some instances, hydraulic cylinders have buckled rather than turn the ring. At lower pressures, the ring can be moved, and there is enough stored energy in the vessel to ruin someone's day completely. Properly designed autoclaves incorporate several additional interlocks for added assurance. These extra interlocks are comparatively inexpensive and should always be designed to be failsafe. In tests well beyond the design and proof pressures, this door type has shown that the slight deflection caused by the over-pressure moves the door and hub faces far enough apart to cause the O-ring seal to fail, thus releasing the pressure. The escaping air is diffused past the locking ring, preventing injury from high speed jets of air. There are other door types available. These are proprietary designs having special characteristics which suit them to a variety of applications. For example, some door designs are simpler than the locking ring type, having no notched cutouts at all in the locking rings. They are easily operated by hand or power and intrinsically safe, much like the T-bolt configuration, in that any movement of the locking mechanism from closed toward open will release pressure well before the door and hub actually separate. Other simple door types can be provided for smaller, low-pressure autoclaves, sometimes at worthwhile savings in cost of acquisition, but not always in cost of operation. An often overlooked aspect of autoclave access is the rear end. In many instances, the best autoclave is that which has two doors. In the typical industrial autoclave, there is mechanical hardware in the rear, including the circulation fan drive. An autoclave with a rear door will cost more initially. Over its service life, however, it will cost less to maintain, largely because the easy accessibility of components inside will encourage their more frequent inspection. In any autoclave, as in any machine, all major and minor components should be accessible for inspection, repair, and replacement. Overlook this, and the owner will eventually regret it. A full-diameter non-fast-opening rear door costs little, all things considered. On larger machines, it can be mounted on a hinge, davit, or dolly assembly (see photo above) that allows it to be swung or moved away from the autoclave once its bolted flange mounting has been separated. This provides the best possible access to the works inside. It also means that critical components are never buried deep inside the machine where they are hard to get at and thus very likely to be ignored until they cause problems. One mid-sized autoclave built for a southern aircraft repair shop to be as cheap as humanly possible lacked easy access to the circulation fan, and, when last observed by one of the manufacturer's service engineers, was making the most alarming dry-bearing noises whenever it ran. When comparing alternative designs, consider the amount of work that any given maintenance task will require, as well as the degree of difficulty and risk of damage or worker injury. If, for instance, a sixty-horsepower internally mounted fan motor has to be man-handled through a small manway or access port, the potential for trouble is unavoidable. On a user-friendly autoclave, the back door is swung open and the motor is quickly and easily lifted out with a forklift or simple spar hoist. The internal layout varies from one autoclave to another. Some have an air duct at the six-o'clock position which also carries the cart rails, while others have a wide floor with the mechanical components beneath it. Others have the air duct at the top. Typically, autoclaves use an annular air duct running across the full circumference of the interior. The annular duct is attractive by virtue of creating the smallest intrusion into the net available working space inside the autoclave. It reduces the diameter of the cylindrical volume by only several inches. It also creates the greatest skin friction pressure loss. This means that the fan has to be larger for the same amount of air circulation, and that there is more heating from the motor horsepower. If it is necessary to maintain low temperatures with full circulation, this may necessitate running the cooling instead of the heating. The vigorous circulation of air under pressure generates heat by itself, and this can be significant when attempting to operate at unusually low temperatures and high pressures. The interior furnishings of the autoclave can be of galvanized, aluminized, or stainless steel. Up to about 400 °F (204 °C), galvanized is economical and reliable; up to perhaps 800 °F (427 °C) to 1,000 °F (540 °C), aluminized will be needed; above that, one is in exotic territory. Another issue is whether or not the interior shell, the walls of the working space, should be removable. How heavy should this wall be? Representative metal thicknesses range from 18 gauge (.0478 inch) up to 1/8 inch (.125 inch). The heavier the wall, the more durable and resistant it will be to dents, also, the more energy that it will absorb during heat-up and the more that it will release during cool-down. To take a typical example, consider an autoclave with an 8-foot (2.4 m) internal diameter and a working length of 40 feet (12 m). If the interior wall is made of 11 gauge (.1196 inch) steel, then it will weigh well over five tons. Heating just the wall itself to an operating temperature of 300 °F (149 °C) in one hour will take some 90 kilowatts of power. At typical demand charges, that will cost approximately $2,000 (for the month) in addition to the energy charge (for each cycle). Reducing the wall thickness to 18 gauge will drop this expense by approximately 60 percent. For a saving of $13,000 a year, the average autoclave operator can live with a lot of dents. On some autoclaves, strange noises come from the inside as they heat up and cool down. These noises are caused by distortions in the metal interior as it expands and contracts with the extreme changes in temperature. The interior of the autoclave described above will grow nearly an inch in length during the heat-up part of its cycle. Provision must be made for adequate relief of these movements or they will eventually buckle the interior. If the machine is large, it will require an interior floor adequate to support personnel walking on it, as well as safety devices to protect personnel inside the machine against inadvertent startup. Introducing heat into the working chamber can be done in a variety of ways. For most autoclaves, and particularly those used to process composite parts or perform adhesive bonding of metal structures, the easiest and least costly initially is electric heat. Resistance heaters are compact and reliable and can be placed conveniently in the circulating air duct. Since the thermal mass of these heaters is small, control of chamber temperature is precise and additional heaters can usually be installed at a later date without excessive bother. However, the cost of this additional installation may be quite significant in comparison with a larger autoclave. These heaters are essentially 100% efficient and can be fitted for any voltage, single or three phase. Installing more capacity than is required extends the life of the heaters by allowing them to run at lower surface temperatures and provides greater assurance of attaining required heat-up rates. Increasing the heating capacity generally costs little in initial price. It is unsafe to automatically assume that every autoclave manufacturer uses high quality tubular Incoloy-sheathed rods, individually replaceable and properly supported. In the interest of economy, some expect the customer to accept nichrome wires strung on ceramic insulators. The drawback to electric heat is operating cost. For a small autoclave operated only periodically, this may not prove to be a major issue. For a mid-size or larger autoclave, the electric bills over the service life of the machine will add up to quite a few times the entire cost of the autoclave. For example, in the Rochester, New York, area, where the price of electric energy is four times that of natural gas before taking demand charges into consideration, an autoclave six feet in diameter and twenty-four feet long (with a light-gauge interior wall) would cost about $2,000 a month in demand charges plus an average of $14 an hour in energy when running. The demand charges, incurred as soon as the autoclave is turned on, even if for only a moment, would equal the purchase price of the autoclave in only a few years. Experience with utility bills suggests that this will get worse in future. The easiest alternative to this is steam heating. This presupposes the presence of a boiler capable of generating steam at high enough pressures to reach the required temperatures. An existing high pressure steam plant is a fine thing to have on hand, and facilitates the use of steam coils, which are simple, compact, and easily controlled. The purchase price of steam coil heating is roughly comparable to that of electric heating, but the operating cost is dramatically lower. If high pressure steam is not available, consider a small dedicated boiler for the autoclave. The cost can be surprisingly low, making this alternative nearly as economical as direct gas-firing of an internal heat exchanger. It also enables you to run your autoclave on natural gas, propane, butane, or fuel oil, sometimes interchangeably if the boiler is set up for dual-fuel operation. Where gas supplies are susceptible to interruption, using a small high-pressure steam boiler to run the autoclave and ovens can be a life-saver when dual-fuel firing is incorporated. A small vertical boiler requires little floor space. If local laws require the licensing of high-pressure boiler operators, this can often be a simple matter of training existing plant personnel and having them licensed for single-boiler operation. Equally economical to operate is an autoclave with a gas-fired heat exchanger built into the pressure vessel. Although this presents some design limitations, it is simpler than using synthetic heat transfer fluids, and of somewhat lower cost. The gas burner assembly is fitted to the far end or the side of the vessel and fires into a heat exchanger inside the air duct. The hot end of the replaceable tube is covered with turbulators for better heat transfer. This recovers the greatest part of the energy of the flue gas. It is simple and reliable, using ordinary natural gas, butane, propane, or other industrial fuel gas. There are alternative configurations, including a secondary circulating loop which ducts a portion of the primary air flow through an external pressurized heat exchanger. This bypass flow can also be utilized for cool-down using an air-over heat exchanger. While gas firing does not readily lend itself to small machines, it can be fitted to autoclaves of three to four foot diameter and up. The longer the machine, the longer the heat exchanger tube and thus the more efficient it will be. This heating option is less costly than hot oil and more costly than electric or steam (assuming an existing boiler) to purchase, but the extra expense is paid back very quickly. Over its full service life, the electrically heated autoclave will cost enough to have paid for another four or five comparable autoclaves. For any but the smallest lab machines, gas firing and steam heating are, to put it plainly, the best alternatives to consider. In some circumstances, when steam is available in the plant, considerable money may be saved by using live steam injection. In this approach, the entire interior of the autoclave is filled with live steam at the appropriate pressure. Commonly used in the rubber products industries, this can be adapted to use in curing composites. It requires different vacuum bagging materials but has the advantage of eliminating heaters, ducts, and the circulation fan. With external insulation, there is more room available for workloads, for a given size of pressure vessel. Naturally, this approach presupposes the availability of an appropriately rated boiler. In certain applications, a low-pressure steam autoclave can replace an ordinary curing oven. The combination of vacuum consolidation, which is equivalent to approximately ten to fourteen psi external pressure, and steam at about the same gauge pressure, will give better results and faster heat-up than the oven would. This approach would be less suitable for materials that have to be brought to curing temperature slowly, since steam transfers its heat fairly quickly compared to even a turbulent circulating air flow. Furthermore, since the interior of the vessel is repeatedly exposed to steam and then air, over and over again, an allowance must be made for corrosion of the vessel walls. In some circumstances, an externally fired heater brings synthetic thermal fluid to temperatures of 600 °F (316 °C) to 800 °F (427 °C), and special pumps circulate it through heat exchangers inside the autoclave. This has both advantages - gas or oil can be used as a fuel without much concern for the space occupied inside the autoclave working volume - and disadvantages - the cost is very high, and it can be trickier to maintain properly. Additionally, it can serve to heat and cool the autoclave by routing the heat transfer fluid through either the heater or the cooling coil, as required by the process. Taking all things into account, the most cost-effective heating options, over the full service life of the autoclave, will be either a high-pressure steam boiler or gas-firing using an internal or external heat exchanger. Cool-down at the end of the process cycle requires a means of extracting heat from the autoclave. The necessity of controlled cool-down will itself depend upon the work being processed. With some composite materials in thick lay-ups, slow cooling prevents internal microcracking of the resin matrix resulting from thermally induced stresses. The cooling method used will depend upon the highest temperature reached before cool-down and the degree of precision that must be maintained as the chamber temperature ramps down. For low temperatures and cool-down rates that can be allowed to vary significantly or simply cool-down at any rate results from a fixed flow of coolant, water circulated through a coil in the airstream will be effective and inexpensive. A serpentine finned coil placed at the circulating fan input or adjacent to the heater array serves this purpose using plant water as a coolant. If once-through cooling water and a cooling tower are not available or are not acceptable, then a simple closed loop cooler can be built into the autoclave. Precisely controlled cool-down rates may or may not be easily attainable with this arrangement. In an autoclave operated at high temperatures, special precautions must be taken in cooling. Pumping cold water into a cooling coil at 800 °F (427 °C) will shorten the coil's life. It also makes it difficult to control the cool-down rate. When cold water hits a heat exchange coil at 800 °F (427 °C), flash steam is generated, along with mechanical shocks to the system and considerable scaling inside the coil to the extent that the water contains dissolved solids. Disposal of the steam and the hot water may prove to be difficult, and the service life of the cooling system may be short. This can be alleviated to some extent by first precooling the coil with a flow of compressed air followed by a mist of water and compressed air. This is only marginally better than cold water by itself, and it does little to eliminate flash steam. For temperatures up to about 800 °F (427 °C) and cool-down rates that must be held to close tolerances, synthetic heat transfer fluid will extract the heat from the autoclave without a phase change (i.e., boiling). Passing the hot oil through an air heating coil with controlled air flow will enable the system to modulate heat flow out of the autoclave precisely enough to maintain a specified cool-down ramp rate. This heated air can be dumped wherever it will result in the most good or the least harm. The drawback to the use of fluid heat transfer is initial cost. It adds perhaps ten percent to the price of the autoclave in mid-size range installations. Fluid life is estimated to range from five to fifteen years, depending upon length of exposure to the highest temperatures as well as the maintenance of internal cleanliness. If the highest internal temperature will not exceed 300 °F (149 °C), then propylene glycol might be used as a heat transfer medium. As this chemical is a constituent of food products, such as ice cream, there need be no toxicity concerns. It has approximately the same specific gravity as water, so pumping is straightforward. Since there is no phase change, coils don't build up scale deposits. Fluid life is very good if air is kept out of the loop. Propylene glycol must be used without water dilution, and stainless steel plumbing is not necessarily mandatory. The cost of propylene glycol is not trivial, so the amount of coolant in the loop has to be balanced between the interests of economy and heat dissipation. It once unpleasantly surprised one large autoclave customer to learn that closed-loop water cooling systems were strictly regulated in his locale. The price tag on this nasty surprise was in the five-figure range. In some localities, dumping pristine and clean cooling water down the drain may be illegal. In general, not using water for cooling can have a number of real advantages. External motor drive on small autoclave, shaft seal, during construction. Unless the autoclave uses steam injection, the circulation fan carries the burden of assuring temperature uniformity throughout the working chamber. Since the heat flows from the source, whether electric resistance, steam coil, or firing tube, into the circulating air stream and then into the workload, the greater the airflow turbulence, the better the heat transfer, particularly with workloads that are heavy and dense. The fan drive must be sized for the conditions creating the greatest load on the fan, i.e., lowest temperature and highest pressure, even though this combination of conditions rarely occurs. Ideally, this means backward-incline fans; these are more efficient than radial impeller and forward-curve types. The purpose of circulating the air or inert gas through the autoclave is to assure effective heat transfer and temperature uniformity. Vigorous circulation and careful attention to where the airflow actually goes are the best ways of accomplishing this. As a rough rule of thumb, do not consider less than 300 feet per minute average air speed through the empty workspace of the autoclave. More than this will make heat transfer more effective. The aircraft industry has specifications relating directly to temperature uniformity. Even if the application is non-aerospace, one of these specifications may be worth adopting to assure process quality and reliability. Fan drives can be internal or external. Internal drives have the motor inside the autoclave in an unheated chamber. A thick wall of insulation keeps the heat out, and the motor is under full autoclave pressure. External drives require a shaft seal to carry the drive shaft through the pressure vessel wall. Internal drives are simpler, result in slightly less floor space taken, and impose a small but essential cooling load; external drives require more elaborate drive shaft arrangements and use high pressure seals. Selection of the internal/external drive arrangement is often idiosyncratic. The service life of the high-pressure shaft seal can be difficult to predict, and it may safely be assumed that the seal will cost a good deal more than the motor itself. For instance, a 2-inch (51 mm), 150 psi seal for a 50 hp motor will cost $2,000, whereas the motor itself is half that much. Generally, the combination of vessel pressure, shaft diameter, and fan speed encountered in autoclaves is such as to make the use of a shaft seal reasonably practicable. Access to the motor room on an autoclave with an internal fan drive is through the back door or a manway. The autoclave working space is not reduced, as the pressure vessel is made slightly longer to accommodate the fan drive. The accessibility of the hardware in the back is of the essence. Eventually, the maintenance personnel will need to get at it, and access then suddenly becomes very much an issue. Although this does add to the initial price, well-designed autoclaves feature removable back ends which provide easy and unrestricted access to the hardware in the unheated area. It is difficult to realize how valuable this is until it is suddenly necessary to remove a sixty-horsepower motor that weighs well over half a ton through an opening just barely large enough for it to pass through. Some autoclaves have the circulation fan, complete with motor, mounted in an end-bell of reduced diameter. While this allows the assembly to be removed easily, it also means that the fan is undersized in diameter and thus less efficient. If the fan impeller is mounted on the motor shaft or an extension of it (direct drive), then the fan speed is constrained to that of the motor, typically 1750 rpm, and that will most likely result in suboptimal fan operation, given the sensitivity of fans to rotational speed. Fans are like airplane propellers; the larger they are and the more slowly they turn, the better they are. It's the law. Some applications allow doing without the circulation fan and air heating altogether. If the parts being processed are fairly simply geometrically, it may be feasible to use molds which are themselves integrally heated. For example, it is feasible to manufacture flat and single-curvature light aircraft landing gear springs on inexpensive aluminum molds with electric heating pads bonded directly to the bottom of the mold. This eliminates the cost of the motor and fan as well as the air heaters and uses much less electricity than a comparable electric autoclave would require. In this way, the autoclave provides consolidation pressure alone. There are limitations to this approach, such as mold complexity. Sometimes, the parts are heated from one side only; sometimes, the mold has top and bottom parts, each fitted with heaters. Although not usually feasible in a job shop, this type of autoclave can afford significant savings when only a small range of comparatively simple parts is being made. Since failure of the circulating fan will have immediate and unhappy consequences for the heat exchanger or heating elements, detection of circulation fan failure is vital. This can be done in several ways. First, monitor the surface temperature of the heater, whether coil or element. If the airflow fails, this will rise suddenly, and the control system can execute an immediate shut-off. Second, install at least one and preferably two airflow sensors. Since the airflow may be at very high temperatures, this can be done with remotely mounted pressure switches that connect to the high and low pressure sides of the fan by means of stainless steel tubing long enough to put the switches well inside the cool area of the inside of the vessel. These switches should be wired in series on one side for the control circuit, such that either one opening will disrupt the heater power, and in parallel on the other side so that the computer can detect which one has changed state. Internal fibreglass insulation (pipe & tank board) applied by mechanical retainer, rated at 450 °F (232 °C). The substantial mass of the pressure vessel provides assurance of pressure containment, but it represents an equally massive heat sink which must be heated and cooled cyclically as the autoclave runs. Steam autoclaves are necessarily insulated on the exterior, making this heat loss unavoidable. Autoclaves using air or another gas employ thermal insulation on the interior, and this incurs a one-time penalty in the cost of the pressure vessel and a slight operating cost resulting from the somewhat greater internal volume to be pressurized. The insulation, which is protected behind a metal shell, is sized to keep the heat loss within an acceptable range and to keep the temperature of the outside surface of the vessel below that which would affect worker safety. Generally, this is 120 °F (49 °C), with 140 °F (60 °C) sometimes allowed on fittings and plumbing. Depending upon company policy on energy conservation, this temperature may be set even lower. Both mineral wool and fibreglass are used in autoclaves. The thickness varies with internal temperature, ranging from a bare minimum of two to three inches up to three to four times that, the rough rule of thumb being one inch per hundred degrees F. Economically, the biggest effect is to raise the pressure vessel cost by increasing its diameter. This effectively discourages over-specifying the insulation thickness. One minor factor is ensuring that the insulation can "breathe", since air flows into and out of it as the pressure in the autoclave changes. Additionally, the sheet metal retaining the insulation requires some provision for thermal expansion. Even an autoclave as short as twenty feet experiences considerable movement across a temperature difference of several hundred degrees. The choice of pressurizing agent is driven by the process. Air may be acceptable for autoclaves operating at comparatively low temperatures, but it may be wholly unacceptable beyond that. The flammability of the materials often used in composite parts increases under pressure, as the partial pressure of oxygen rises. Thus, nitrogen or carbon dioxide may be used for pressurization. Hydroclaves use water as the pressurizing medium. Since the boiling point of water rises with pressure, the hydroclave can attain high temperatures without generating steam. While simple in principle, this brings complications. Substantial pumping capacity is needed, since even the slight compressibility of water means that the pressurization stores non-trivial energy. Seals that work reliably against air or another gas fail to work well with extremely hot water. Leaks behave differently in hydroclaves, as the leaking water flashes into steam, and this continues for as long as water remains in the vessel. For these and other reasons, very few manufacturers will consider making hydroclaves, and the prices of such machines reflect this. Parts processed in an autoclave are often vacuum bagged to enable the pressure to operate isostatically on the workpieces. In simplest form, the workload is fully contained inside a loosely fitting bag made of resilient plastic capable of withstanding the temperatures involved. When vacuum is drawn, the bag is compressed by atmospheric pressure and compacts the components inside. Between the parts and the bag, an absorbent material provides a channel for the evacuation of the air and wicks up the excess resin squeezed out during curing. In autoclave processing of composite parts, the vacuum bag functionality may be where the greatest variety may be found. Some shops will leave the bag under full vacuum from lay-up to post-cure tear-down. Others will hold the vacuum only until the autoclave reaches full pressure. Yet others will back-fill the vacuum bag with inert gas, typically nitrogen, at zero pressure. The role played by the vacuum bag's internal pressure can be critical in the consistent production of high-quality multi-ply composite parts. A SAMPE paper describes the benefits of controlling the vacuum and pressure under the vacuum bag in a lay-up. By following the vacuum in the bag with pressurization, the formation of voids in the resin matrix is suppressed, reducing the microscopic flaws which seed cracks and other matrix failures. Installing this capability on an autoclave involves additional control valving and software, and, in light of the benefits in performance of the composite materials, does not have an unreasonable effect on machine price. An ejector pump can be used for rapid evacuation of the air inside an autoclave that is to be pressurized with inert gas. To eliminate oxygen from the interior and replace it with a pressurizing agent that does not support combustion, the simplest way is to remove nearly all of the air and then introduce the nitrogen or carbon dioxide. 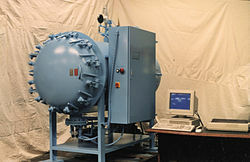 It should also be noted that autoclaves have to be designed for such vacuum service, since the vessel itself may require stiffeners to withstand the external pressure, and ordinary access doors and man-way covers often are rated for internal pressure only and will not be able to withstand the external pressure that results from interior vacuum. The vacuum is delivered to the work-pieces by manifolds and individual tubes fitted with quick-disconnects on the interior walls. The simplest vacuum system consists of a pump and gauge on the outside and a single quick-disconnect port on the inside. In more elaborate arrangements, there may be a dozen or more individual vacuum supply lines going into the machine, each to a separate QD port, with as many gauge lines coming back out to vacuum sensors wired to the control system, and an inert gas backfill under controlled pressure for when the pump is shut off and the vacuum lines vented during the cure cycle. The flow capacity of the vacuum pump is less important than its peak vacuum level. Any significant flow means that there is a leak in the vacuum bagging, and a powerful pump will try to overcome this, resulting in a smaller measured vacuum loss than would be the case with a smaller pump. This would serve to hide the bag failure, because the vacuum drop would be harder to detect. Since at operating equilibrium there should be no air flow at all, it is better to draw a higher vacuum than to try to maintain a high flow rate. There should be a properly sized vacuum receiver tank which can maintain system vacuum if the pump fails during a production run. This will be feasible only if the vacuum plumbing is virtually leak-free. This is why vacuum leakage is one of the major concerns in the pre-acceptance testing of the machine. For a typical composites autoclave, a 5-to-10-cubic-foot (140 to 280 L) receiver might be appropriate. Note that this receiver must be ASME stamped for the full operating pressure of the autoclave, since it is conceivable that a vacuum system failure could result in this much pressure being vented into the receiver. When multiple parts are processed, it may be beneficial to have a separate vacuum line for each, reducing the potential loss if one vacuum bag leaks during cure. This is easily accommodated with multiple supply tubes from a single manifold on the outside of the autoclave. Additionally, it is necessary to decide whether each line is to be monitored individually and how this is to be done. If there is a single vacuum sensor, whether an electronic transducer connected to the control computer or only a sensitive gauge checked visually, determining which vacuum bag is leaking means shutting each one off in turn and watching for a slight change in vacuum manifold pressure. Given the airflow restrictions in the average lay-up and vacuum lines, even a complete vacuum bag failure may show up as little more than a small change in vacuum level. Putting a sensor in each vacuum line takes care of this, but costs an additional several hundred dollars per line. Some applications involve two vacuum lines per bag. One is connected to a bag penetration at one end of the part being processed and supplies vacuum from the pump and manifold. The other line returns from a separate bag penetration at the other end of the vacuum bag and through a line back through the vessel wall to a sensor which measures the vacuum level in the bag rather than the level at the manifold. This is preferred, since it provides an accurate indication of the real vacuum seen by the part as a whole. As an option with this arrangement, if the vacuum is shut off prior to cure completion, as is called for in some applications, before the supply line is vented to atmosphere, the gauge line is backfilled with nitrogen from a zero-pressure gas regulator, thus preventing atmospheric contaminants from entering the breather/bleeder fabric. Individual monitoring of each vacuum line does not necessarily require gauge lines, nor does inert gas backfill. However, the extra cost of providing for gauge lines is not much. If vacuum bag pressure control is used, then the appropriate valves and regulators must be built in. If the process generates considerable resin flow out of the workpiece, the process specification may demand resin traps. Some materials lose enormous amounts of highly mobile resin during heat-up, and this flow can sometimes work its way back through the vacuum plumbing perhaps far enough to plug critical components. It is far easier to prevent this sort of damage than it is to repair it. Some resins, such as polyesters, give off significant amounts of volatiles during cure. These will carry out through the vacuum ports and sometimes cause damage to the pump. The better vacuum pumps use oil reservoirs and oil recirculation, and these volatiles can quickly turn the oil into a revolting mush. They also attack the seals of vacuum valves and cause deposits to build up over time. To prevent this, it may be necessary to install condensers on the vacuum port lines. These will require 35 °F (2 °C) chilled water. A small chiller will add several thousand dollars to the cost of the autoclave, plus another several hundred dollars per port for the condenser and separator. The stainless steel resin traps should be designed and made to be easily disassembled and cleaned. Naturally, they must also be fully accessible. While much of the operation of a simple autoclave can remain manual, temperature control is virtually always automated, as this is easily done at low cost. The value of the products processed in most autoclaves justifies a high degree of automation. The hardware and software available for industrial process automation makes fully automatic operation of an autoclave affordable and reliable. It is realistic to design and implement such automation without the services of an outside vendor in many cases. As with the other parameters, the required precision of temperature control depends upon the process specification. The autoclave should exceed this capability by a margin sufficient to preclude all chances of inadequate or excessive temperatures in the workload. Too hot and the parts can be damaged or undergo thermal excursion; too cold and the full structural properties may not be realized. Equally vital is the avoidance of variation in temperature throughout the working volume of the autoclave. Aerospace specifications include maximum allowable variation as well as how to test for uniformity. Electric heating is virtually infinitely variable and thus lends itself to precise temperature control, typically ±1° to ±2°. This kind of precision can be achieved with indirect gas-fired heating, but not as easily. The electric power drawn by the heating elements can be controlled to 12-bit precision by SCR devices driven by analogue signal from the temperature controller. The low mass of the heating element makes it responsive, and sudden and dramatic changes in output - although not generally necessary - can be achieved. The need for accuracy and precision in the measurement of the air temperature inside the autoclave places importance upon the selection and implementation of the sensor. The cheapest and easiest is a single thermocouple placed somewhere in the airstream. For better results at a trifling price, two or three averaged RTDs work better, with higher precision and less drift. While RTDs will respond to sudden temperature changes less quickly than thermocouples will, this does not matter, since sudden temperature changes in autoclaves simply do not happen. One can be placed at the inlet to the circulation fan; this one senses the lowest temperature, assuming that the heater is downstream of the fan. Another can be placed at the point at which the airflow reverses direction and begins to flow past the workload. A third can be placed close to the middle. Sensing air temperature close to a wall surface will usually incur a boundary layer error, or, worse, a stagnation error. Control of pressure presents the fewest challenges. Given a source of air or gas of sufficient pressure and flow capacity, the autoclave control system opens the pressurization valve and shuts it once the internal pressure has reached the setpoint. Depressurization occurs when the dump valve is opened. On large autoclaves, a silencer or muffler may be needed. The valves are on/off rather than modulating, for cost reasons. As the temperature rises, the gas expands, driving the pressure upward. A trim valve releases the excess, maintaining the setpoint. In some applications, the precision of pressure control directly bears upon the success of the process. For instance, core materials have limited compressive strength at elevated temperatures; even a small over-pressure can collapse the core and ruin the workload. In a poorly designed autoclave, oscillation of the pressure can result in chattering of the inlet and outlet valves. One means of preventing this is utilizing large valves for filling and dumping and small valves for trimming at and near the setpoint. Alternatively, modulating valves will avoid this phenomenon. Often the least controlled factor in an autoclave, the vacuum may or may not require modulation. In some instances, it is not automated at all and involves little more than a connection to the plant vacuum system, a few manual valves, and a gauge. At the other extreme, the vacuum control system may be considerably more complex than that of the air temperature. Safety is always a concern with autoclaves. The ASME code is extremely conservative; as a result, pressure vessels are among the safest, least risky types of machine in use today. However, this doesn't mean that safety can be taken for granted. The ASME code requires, in addition to very conservative design of the vessel and its fittings, the installation of a code-stamped safety valve set at the design pressure. This valve is safety-wired to prevent changes in its setting and will pop open whenever the pressure in the autoclave exceeds the design pressure. While this triggering of the valve will relieve any possible overpressure in the vessel, it must also be able to keep the pressure source, whatever it is, from pushing enough air, inert gas, or steam in to bring the pressure back up to an unsafe level even with the safety valve wide open. A conservatively designed autoclave has multiple safety valves which are each sized to be able to cope with the greatest available airflow into the vessel plus not less than 30%. The valves are mounted on a manifold that allows multiple pressure vessel outlets to feed multiple safety valves, each one of which can handle the entire air dump by itself, even if one pressure vessel outlet is accidentally blocked by debris from an internal failure. The added cost of the redundant safety valves is approximately one tenth of one percent of the machine price. Air or nitrogen from the source of pressurization is not the only potential cause of sudden over-pressure. An autoclave fire is guaranteed to raise the internal pressure, and this may exceed the safety valve's ability to vent fast enough. The solution is oversized safety valves and rupture disks, and more than a single one of each. Knowing how much air or gas can, in the worst possible set of circumstances, be delivered to the inlet of the autoclave is part of the specification process. Doing this right depends upon providing the correct data to the autoclave manufacturer. This matching of the safety relief valving to the plant compressed air capacity is an example of how the autoclave is regarded not as an isolated entity but as an integral part of the plant in which it is sited and operated. Composite parts and the materials used in their curing are often flammable, even if not readily so at room temperature and atmospheric pressure. The elevated temperatures and pressures involved in curing increase the risks of potential combustibility. While air is a suitable means of pressurizing an autoclave curing materials at 100 psi and 350 °F (177 °C), it may be too hazardous in an autoclave processing potentially combustible materials at 500 psi and 700 °F (371 °C). The risk may also be too high in extremely large (and expensive) cure loads. In such applications, nitrogen can be used, since it is both inert (in that it normally won't support combustion) and readily available. In bulk liquid form, it costs less than soft drinks. It is also a realistic alternative to special air compressors when pressures significantly higher than one hundred psi are required. The simplest and most cost-effective safety device is the rupture disk. Incorporated into the pressure vessel in fabrication, this is simply a port in the vessel closed off by a finely machined plate that will burst at a predetermined pressure. This plate may be made of either aluminum or carbon. The disk is fitted within a flanged assembly that discharges the autoclave's pressure out into an exhaust pipe to carry the whoosh well away from personnel. The disk is fairly inexpensive and can be replaced easily. The rupture disk should be used to back up the safety valve and sized to drop internal pressure as quickly as possible. Autoclave fires can release considerable energy into the air inside, resulting in a sudden pressure spike. The rupture disk is designed to release at a pressure slightly above that of the ASME safety valve and well below that of the hydrostatic test; it is never called into play unless there is a sudden pressure increase beyond the capacity of the safety valve. The very modest cost of even a pair of fairly large rupture disks makes this an extremely attractive option. The rupture disk should be not less than twice the diameter of the inlet to or the outlet from the vessel, whichever is larger. The type of door will determine whether it needs its own safety device. The T-bolt door is intrinsically safe, and the ASME code does not mandate an interlock for it. The other door types do require an interlock to prevent the possibility of opening when there is ~½ psi or more inside the vessel. Every autoclave will have this much; it's the absolute least that is legal. However, a prudent autoclave operator ought not to be willing to settle for the very least that is required. Even the best made components are not perfect, so the conservatively designed autoclave uses backup interlocks in both hardware and control software to reduce risk to the lowest level reasonably attainable. For example, if the control system senses any pressure in the vessel, it blocks the door opening cylinders with fail-safe valves, thus precluding any attempt to bypass the safety interlock manually. This is in addition to the code-mandated interlock. If desired, an additional interlock can be installed on a T-bolt door, too. Another safety consideration is how sensors are wired. If a device is capable of failing in a particular state, then the failure should be such that a false indication of pressure is given. This is far better than a false indication of no pressure. Nevertheless, checking the pressure as a condition to opening an autoclave is simply not safe enough. Particularly with industrial size autoclaves, such as those used in the rubber industry, it is critical that the autoclave be opened only after checking both the pressure and temperature gauges. If water inside an autoclave has managed to become superheated, the pressure gauge may not indicate the presence of steam even though the temperature may be significantly higher than the local boiling point for water. If the autoclave is opened in this state and the superheated water is disturbed, a steam explosion becomes possible. This phenomenon can easily produce fatal burns to people in the vicinity of the explosion. Often, victims die only after a painful agony sometimes lasting as long as a month. As insurance and regulatory requirements vary from one location to another, they should be made the subject of discussion during the design process. If a small high-pressure steam boiler is needed, it may be necessary have to have an operating engineer to run it. In many localities, an existing employee can be trained to do this and given a license limited to the boiler in the plant. Some parts of the world require that autoclaves be licensed or operated only after inspections have been done and permits have been issued. The price of an autoclave will vary enormously as a function of what has been designed and built into it. It is sensitive to some factors and insensitive to others. The price will depend largely upon its diameter and to a much lesser extent upon its length. Some of the features of an autoclave allow a wide range of options, and some of these can affect price dramatically. In considering acquisition of an autoclave, it is prudent to take nothing for granted; look at all possible options and variations. This includes whether the autoclave is the optimal means of accomplishing the process requirement. New technology in advanced composites, for example, is reducing the supremacy that the autoclave long had in the industry. While doubling the design pressure might increase the cost of the autoclave by fifty percent, doubling the diameter might double or triple its cost. On the other hand, increases in length are surprisingly inexpensive. Doubling the length of a short 6-foot-diameter (1.8 m) autoclave might add as little as five or six percent to the final price. As a rule, it is most cost-effective to think of length in five- and ten-foot increments. Adding one foot of length to a 20-foot-long (6.1 m) vessel is not much cheaper than adding another five feet. This is predicated upon the customary practice of fabricating the pressure vessel from 5-or-10-foot-wide (1.5 or 3.0 m) rolled plates. Several inches of insulation must be added to the inside working diameter to get the diameter of the pressure vessel. Putting the insulation on the outside yields the smallest pressure vessel for a given inside working diameter, but the energy required to heat up the vessel itself each cycle soon makes this a very unattractive way of economizing, unless steam injection is used for heating, in which event external insulation must be used. For most machines, figure on four to six inches of insulation thickness. On machines rated at less than 300 °F (149 °C), this can be reduced to three inches (76 mm) . For temperatures over 600 °F (316 °C), it should be increased to eight inches or more. This affects the diameter significantly, but the trade-off generally favours the additional insulation. If price is a major issue, some changes can constrain it without giving up important capabilities, while others can be deleted only at the cost of materially reducing the machine's functionality and value. Autoclave prices vary spectacularly from one manufacturer to another, as well. Sometimes, they seem to change with the phases of the moon. It is unwise to assume that every autoclave manufacturer or seller will charge pretty much the same price for a given configuration. Moreover, the prices of used machines can vary quite beyond belief. It is not uncommon to find used machines priced well above new ones, as well as hardly used autoclaves that sold at auction for cents on the dollar. When looking into whether to purchase a new autoclave or an existing machine, the prospective purchaser will find that used machines may or may not be less expensive than a new one built to his precise specifications and that they can be very hard to find in the required configuration. If a used machine matching the requirements is located at a reasonable price, be certain to check for such things as door hinge wear, undocumented modifications made by the user or others (much more common than you might suspect), and the availability of the pressure vessel registration documents. To be really safe, ask for the construction prints and then compare them to the machine itself. Uninspected additions made after the insurance inspection may be trifling (for example, door handles welded on after the vessel was inspected), but they can enable an insurance company to disallow a claim for damages if something disastrous happens. If the autoclave's U-1 form, which is issued by the constructor of the pressure vessel, is not available, or if the autoclave's data plate is not readable or perhaps not even there, then one might be looking at a homemade pressure vessel. Be aware that many pressure vessel shops will not touch a vessel that has been manufactured elsewhere, for even the smallest modification. Never buy an autoclave that needs work done on the pressure vessel itself unless the deal includes all modifications and retesting and re-inspection prior to acceptance of the machine. Otherwise, one can end up with the most expensive paperweight in the company's history. If in doubt, verify that the vessel's National Board registration is indeed valid. Check to see if the manufacturer is still in business and whether door seals are still available. Even more important are the construction and installation drawings as well as the wiring diagrams. Are these available, and are they current? If it uses electric heat, will it be necessary to buy a large transformer to match the voltage? Modifying a 230 volt machine to operate on 460 volts or vice versa can cost a good deal more than simply installing a transformer. Very few of the used machines on the market are fitted with advanced controls; will the existing controls serve the current and anticipated needs? Old and obsolescent control systems can be replaced. While the cost is not trivial, a sound pressure vessel can be upgraded at less expense than the price of a new autoclave. Moreover, the machine becomes available more quickly. Of the various factors which drive the economics of operating an autoclave, none is as important as means of heating, and this will have even greater relevance as energy prices rise. Electric heat is essentially 100% efficient, and it is the easiest and most precise to control, as well as the least costly to maintain (if the autoclave is designed with maintenance in mind). However, the cost per kilowatt-hour makes this the most expensive. It may easily be demonstrated that the money spent on electricity over an autoclave's full service life may equal four to six times the price paid for the autoclave in the first place. While the autoclave is not as ubiquitous as the oven, it is typically used in a number of classes of application. Since rubber vulcanizing cannot be done in an air atmosphere, steam is used, and this mandates a pressure vessel of suitable capability. This is a batch process, thus a fast-acting door is necessary. The only practical means of accomplishing this is an autoclave, and many are used in the rubber products industry. The manufacture of pressure-treated wood may require autoclaves. The sterilization of waste products is yet another application of steam autoclaves. The aerospace industry manufactures small numbers of very expensive products and is thus able to afford the high capital and unit operating costs of autoclaves. Typically, this entails applying carefully controlled levels of heat and pressure to parts and assemblies. The curing of composites requires compacting the piles of material, pressing this material against the mold, forcing out volatiles and excess resin, and holding everything motionless during the entire cure cycle. In structural adhesive bonding, the autoclave forces the parts together and holds them while the adhesive cures. Unlike a press, the autoclave applies pressure uniformly, irrespective of the shape of the workload. The autoclave is loaded, and the vacuum bag and thermocouple connections are made to the autoclave. The door is closed and locked, the MPID confirming closure. Pressure is applied until the required level is attained. Depending upon requirements, the vacuum bag can be kept under vacuum or not. Heating begins and is maintained at the specified ramp rate, typically 5° to 10° per minute. Once the required temperature is reached, a timed soak at that temperature begins and runs for the necessary duration. At the end of the soak period, the cooling function brings the temperature down to a set value at a specified ramp rate. The vessel is depressurized and the circulation stopped. Failure in an autoclave differs materially from ordinary machinery defects only when it involves the pressure containment. Since compressed air, gas, or steam can store considerable energy, strict measures are mandated by law to prevent such incidents. Generally, pressure vessel failure takes one of two forms. One is rupture of the vessel, normally by crack propagation. Cracks in steel under stress can spread at speeds of up to more than a mile per second. This results in the release of stored energy, one effect of which is the acceleration of the rupture itself. Such releases are effectively explosions. The other form is the failure of a mechanical safety device, such as the interlock that disables the door opening mechanism as long as vessel pressure exceeds a conservative value, such as ¼ or ½ psi. Less commonly, there can be a failure in the presumption that a door breechlock ring cannot turn when the door is under pressure. The geometry of the camming ramps results in a precise rotational torque tending to open the door when pressure acts against the inside of the door. This force also creates a friction which resists this rotation. If the coefficient of friction on the ramps is low enough, then the lock ring can move on its own. It can even buckle the hydraulic actuators used to turn the ring. The interlock devices on autoclave doors are intended to prevent improper sequences, not to mechanically restrain the door against movement. Thus, the interest of safety is best served when the control system incorporates multiple devices providing not only redundancy but a variety of methods, the failure of any one of which cannot defeat the entire safety system. In the chemical and food industries airtight vessels to apply heat to a substance are also called retort. ^ For a somewhat self-congratulatory description of such an autoclave, see http://www.change.godrej.com/2006/janfeb/Hydroclave.htm. ^ "Hydroclave" is also a tradename for a manufacturer of conventional steam sterilizers. ^ Contrary to popular assumption, water is not incompressible. It undergoes a reduction in volume of approximately 0.5% per 1,000 psi of pressure. ^ Administered by the Special Equipment Licensing Office (SELO) of the General Administration of Quality Supervision, Inspection and Quarantine (AQSIQ) of the People's Republic of China. ^ Minimum design metal temperature. ^ This may well be significantly below that of the working volume of the autoclave. ^ But not relatively economical, as their prices can bring a prospective buyer to his knees if he is unaccustomed to making such purchases. ^ This assumes a level floor. ^ There may not be a legal requirement for safety interlocks similar to those mandatory on hydraulic presses, but it would still be a good idea to reflect on the possibility of an operator having his hand in the wrong place after pressing the door cycle switch. A few tons of steel door being swung shut by hydraulic cylinders won't slow down much because someone's hand is in the way. ^ Technically, this is driven entirely by the relationship between the torque that can be exerted on the locking ring by the actuator(s) and the frictional resistance to turning when the autoclave is under pressure. ^ As little as several psi has caused fatal accidents. ^ In the aerospace industry, this would be considered mid-range in size. ^ The solution is a "man-inside" switch, generally taking the form of a lanyard running the entire length of the autoclave interior. Someone trapped inside when the door is closed can pull this to stop the machine. However, care must be taken to ensure that this does not disable the mechanism that unlocks and opens the door. ^ These prices may not be current, but the ratio probably is. ^ An autoclave operating at 375 °F (191 °C) and 100 psi will work well with air, but at substantively higher temperatures and pressures, nitrogen is far safer. ^ Porosity in Carbon Fiber Composites - An Overview of Causes, Flake Campbell and Andrew Mallow of McDonnell-Douglas Aerospace and Charles Browning of the Air Force Materials Directorate at Wright Labs in Dayton, Journal of Advanced Materials, SAMPE, July 1995. P as before. This has serious autoclave cost implications. ^ Until, that is, the higher pressure of the autoclave is considered. ^ While this will vary extensively among autoclave constructors, it is by no means unrealistic to automate an autoclave without spending much more than fifteen to twenty percent of the machine price. ^ Some resin systems are vulnerable to exothermic heating; in extreme cases, this can cause fires inside the autoclave. ^ One part in 4,096. ^ These are not synonymous. ^ Generally, anything in an autoclave that happens suddenly ends up being very bad news. ^ This is not always the case, since placing the fan downstream of the heater results in better mixing of the heated and unheated air. ^ This can be foam or honeycomb, generally, both of which are weakened by exposure to curing temperatures. ^ In an aircraft plant in Texas in 1965, the door blew off a large autoclave and took out the building wall without slowing down much. All that stood between the door and an office building full of people was a fifty-ton boxcar, which stopped the door. ^ The design pressure may or may not be the operating pressure. In all events, the operating pressure cannot exceed the design pressure. ^ ASME safety valves are dead cheap. No matter how much they cost. ^ However, we have no idea what it tastes like. ^ Aluminum is slightly cheaper. Carbon lasts longer and is more precise. ^ The lead time on a new autoclave can force procurement of a used one that is available in a week's time, and used autoclave dealers understand this phenomenon intimately. ^ For a truly badly designed and constructed autoclave, maintenance is a close second. ^ This cost consists of the energy charge, which varies with the amount of energy used, and the demand charge, which is set by the highest monthly momentary level of power drawn. ^ For a given size and temperature rating, the autoclave may cost five to ten times as much as the oven does. ^ There are minor exceptions where sharp changes of contour exist, but this is accommodated in the tooling, generally through the use of caul plates. ^ The mechanical pressure indicating device required by the ASME code. ^ Pressure vessel failures are very uncommon events.